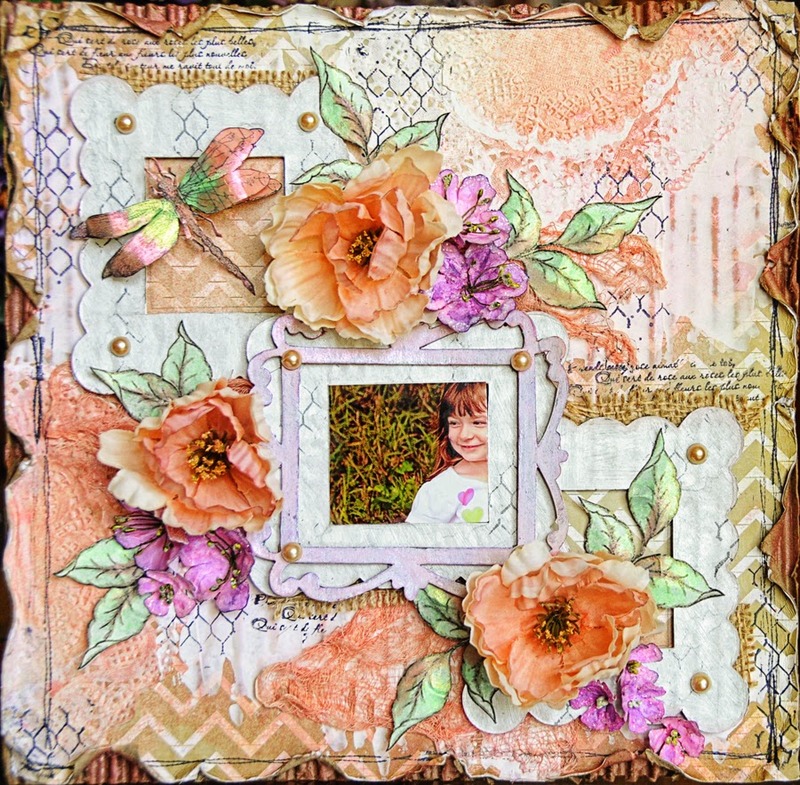 I have a little mixed media layout for you using 3 of the August Color Challenge colors. I omitted the Hydrangea Blue in this project. I started with a 12×12 sheet of patterned paper that I adhered to piece of 12×12 corrugated cardboard. (save those heavy duty boxes!!) I adhered some doilies in 2 different sizes and layered them. I spread some gesso randomly over the background using a palette knife, then sprayed it using Wild Honeysuckle Coral. Once it was dry, I did some stamping over the whole area. I wet the edges of the paper of layout and peeled it back from the base to expose the ridge part of the corrugated cardboard. I ripped and curled back the paper. Once it dried, I sprayed the exposed parts with Wild Honeysuckle Coral. I took some creamy peachy colored flowers I purchased at Hobby Lobby, stripped them off of the stems, and spayed some Wild Honeysuckle Coral just in the middle. 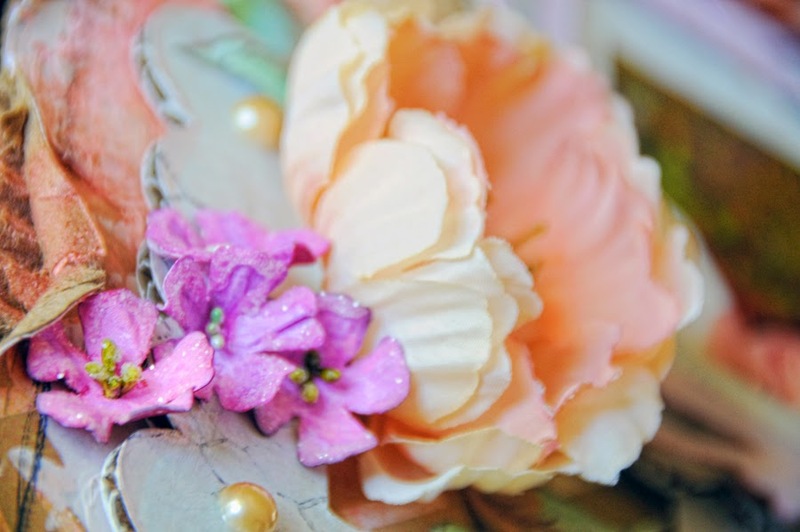 The color slowly spread through the flowers and created faded look which came out fabulous. 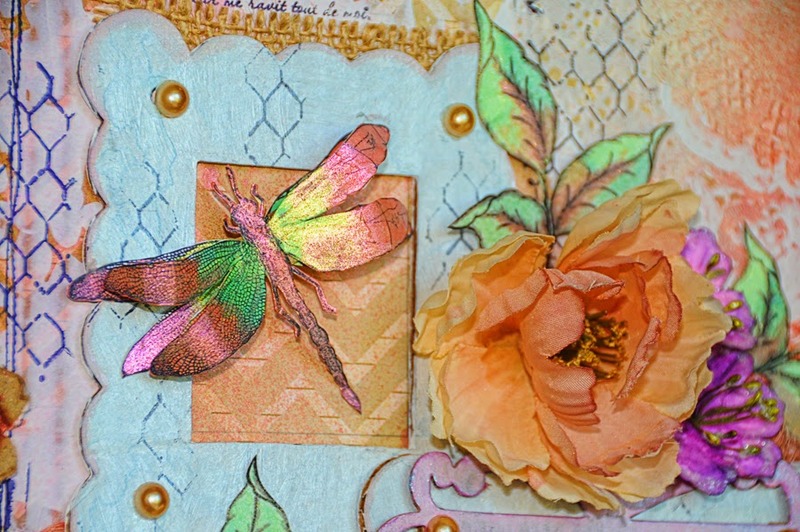 I created a tutorial of the smaller flowers for the Lindys Stamp Gang News Letter. Sign up today and don’t miss another issue. I used Sweet Violet Purple Teal for them. 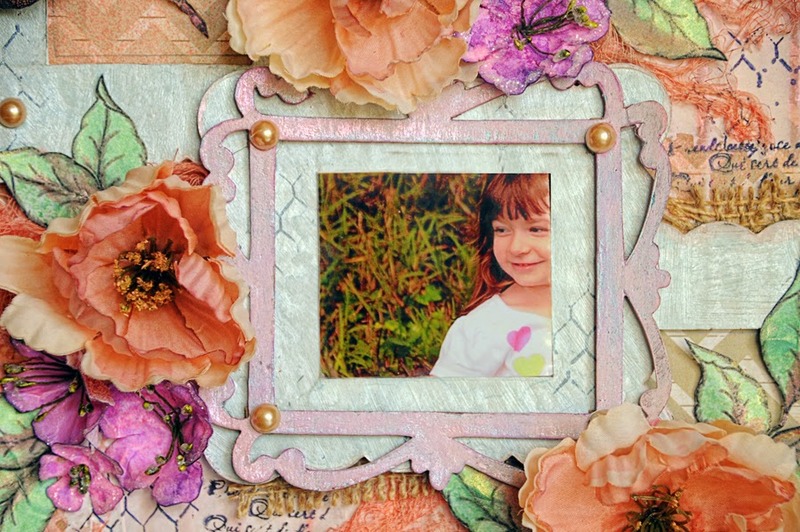 The die cut frames are composed of 2 different Sizzix Dies. I primed them with Gesso. The 3 base frames were colored with Whale Watch Blue. 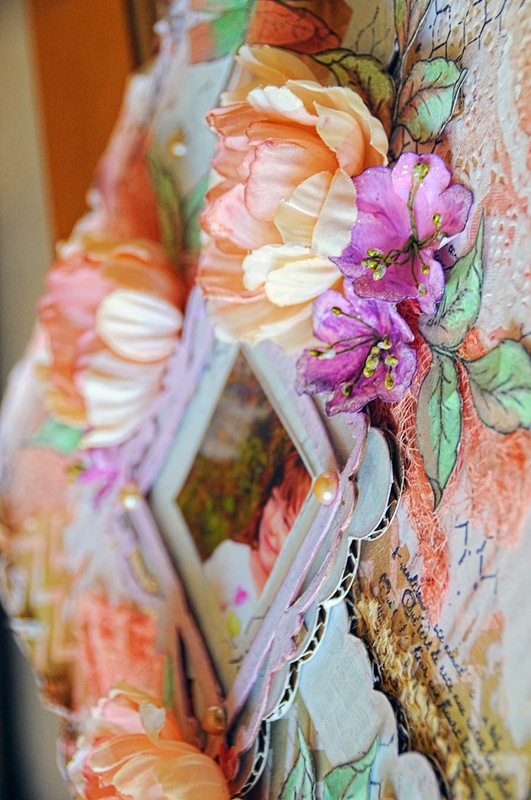 The top frame in the middle was colored with Sweet Violet Purple Teal. Instead of pop dots, I used bits of corrugated cardboard in between my layers. They are the perfect width. The stamped and fussy cut leaves were sprayed with Maidenhair Fern Green, then using a paintbrush, I highlighted them with Wild Honeysuckle Coral. The dragonfly was stamped onto white card stock. I stamped an extra set of wings to layer the dragonfly to give it dimension, then colored it with a paintbrush using Maidenhair Fern Green, Wild Honeysuckle Coral, and Sweet Violet Purple Teal. Thank you for the visit to Lindy’s!! Dont forget to pull out your Color Challenge colors and join us for a chance to win a $50.00 gift certificate to Lindy’s Stamp Gang Store. Check it out the right HERE. Until next time, may you always dream in color!! This is wonderful .. I especially like those flowers … they look like real poppies!